Equipment: cable TV; DVD, CD player, stereo; internet access Wi-Fi (included); washing machine, iron/ironing board; gas central heating; underfloor heating (only in the bathroom/s); storage room (external access only). Feature: Property in a holiday complex (100 building(s) in total). Furnishing: pleasant, bright, homely, carpet, laminate floor. Please note: Non-smoking house. detached house, 6 people, 4 room/s, 3 bedroom/s, 1 bathroom/s, approx. 80 m², 2 floor/s, renovated 2010. Bedroom 1: (ground floor, small room): single bed and pull-out bed. Bedroom 2: (roof pitch, carpet): 2 x single bed. Bedroom 3: (attic, carpet): queen-size bed (1.40 m wide). Kitchenette: Kitchen/ cooking equipment: 4 gas rings, oven/microwave, refrigerator, coffee machine, coffee machine with pod system, water boiler, toaster. in the living room. Living room: (ground floor): furniture suite, exit to terrace. From the living room space saving stairs to upper levels. Access/parking: 2 x parking on the road near the house approx. 20 m.
Estate: (private use): approx. 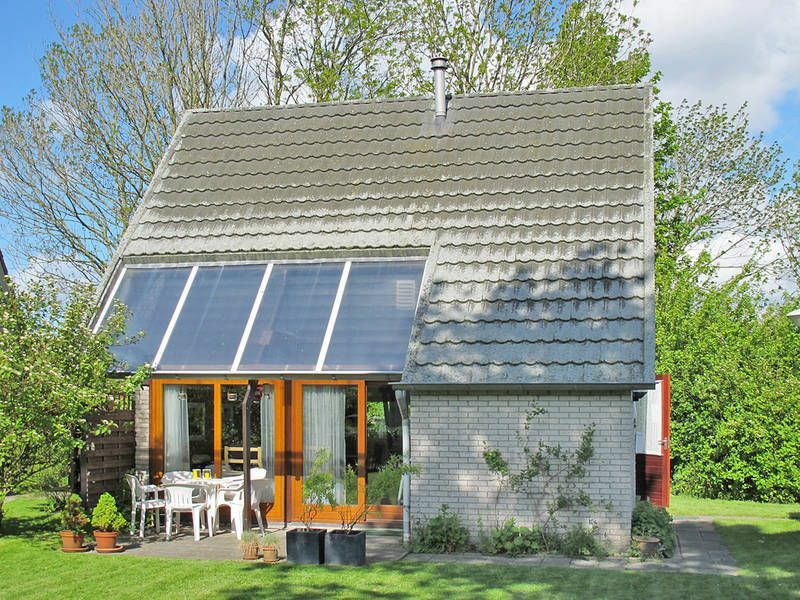 320 m², partially self-contained (hedge), with plants, garden, lawn. Situation: suburbian area, holiday village, dead-end street Oostmahorn. Sports facilities/ leisure time: private use (payment): bikes. shared use (free of charge): football pitch, volleyball, children's playground, children's playing equipment. Beach/waters: Grassy beach in approx. 800 m. Lake in approx. 500 m (Lauwersmeer). Harbour/marina: Harbour/marina in approx. 500 m.
Next village/town: Anjum in approx. 3 km. Center Oostmahorn in approx. 500 m. Dokkum in approx. 14 km. Public swimming pool: Indoor public swimming pool in approx. 14 km (Dokkum). Shopping: Next shopping possibility (Anjum) in approx. 3 km.